I got an email from an interesting guy (Michael Sheehan) who taught at a City College in Chicago for over 25 years (which is a feat in itself since education can be rough, for various reasons that I might do a post about another time) about his English blog Wordmall. 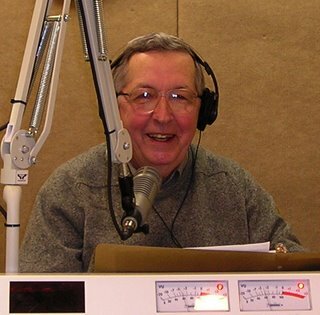 He's retired and lives in Michigan, where he writes, is involved with various organizations, and has a language-related radio show--and it's not on NPR! The reason why I'm making a big deal out of the fact that he's not on Public Radio is because commercial radio stations usually don't cover such obscure topics as language. His show is on just once a week for an hour, but still--if I were to suggest a similar show where I work, they'd laugh and remind me that people aren't interested in such subjects. I looked at the station's site, and I couldn't find his show, but there were some other things I noticed: the station is owned by a shockingly small company, not a huge media corporation (which is extremely rare in today's radio world), and the station has mostly syndicated programming, which isn't surprising, because most radio is syndicated now. So it makes the presence of a language show even more amazing! Since retirement in 1994, I have had an unbelievable life. Way leads unto way, but this has been one heckuva ride. UPDATE: There are now podcasts of the show available. Go to wtcmradio.com and click on the Ron Jolly Show. Scroll down for a list of podcasts, and look for "Words to the Wise with Professor Mike Sheehan," then click to listen. You may hear Words to the Wise only on Tuesday morning from 9;00 - 10:00 am EST. There are, alas, no archives. Go to wtcmradio.com during that specific time slot and click on "Listen Now." Thanks--it seems like an interesting show--sounds fun too! At last -- there are podcasts! Go to wtcmradio.com and click on the Ron Jolly Show. The subsequent menu will list my shows, at least for a month at a time. Thanks--I just listened to a segment. And I will post the link in my post (the site is built in such a way that you can't link directly to the podcast page--there's only a URL for the main page.